You get apple cider vinegar (Seb Ka Sirka in Hindi) by fermenting apple cider. Cider is non-alcoholic and unsweetened beverage that you can make from apples. Apple cider vinegar is used for ages in various ways. They are used to make pickles, added in salads and also used to kill weeds. It has lots of health benefits. It is also very beneficial for hair and skin. It helps in soothing the skin. Fill a bath tub with warm water and add 8 ounces of apple cider vinegar to it. Soak in this water for 15 minutes. This soak helps in restoring the pH balance of the skin as the pH level on the protective acid mantle layer of our skin is similar to the pH level of apple cider vinegar. It is also good for treating itching, irritation and inflammation of the skin. Apple cider vinegar can help in getting you relief from sunburns. Add ½ cup of apple cider vinegar to 4 cups of water and apply it on your sun burnt skin by dipping a washcloth in the solution. It heals the skin and prevents blistering of the skin. Apple cider vinegar is good as a facial toner. Take two cups of water and mix well with one tablespoon of apple cider vinegar. Swiping this mixture on your skin can make your skin tighter. Make sure that you skin is clean and dry before you apply it on your skin. The alpha-hydroxy acids and acetic acid in apple cider vinegar can increase blood circulation and minimize pores. If you have a normal skin, then add 1 part of apple cider vinegar to 2 parts of water for treating your skin. For very sensitive skin, you can add more water. It can stimulate your hair follicles and make your hair grow better, so that you get healthy and strong hair. If you are suffering from dandruff, you can treat it with apple cider vinegar. Take equal quantities of water and apple cider vinegar, and mix well. Massage your scalp with it before you apply shampoo on your hair. You may also add one teaspoon of apple cider vinegar to your regular shampoo and wash your hair after massaging your scalp with this shampoo. The anti-fungal properties of apple cider vinegar help in treating dandruff. The acidic properties of apple cider vinegar balance the pH level of the scalp and prevent any further growth of fungi. Apple cider vinegar is good as a hair rinse. Add 2 tablespoons of apple cider vinegar to one cup of water and rinse your hair with it after washing your hair. Rinse thoroughly and apply a conditioner on your hair. Acetic acid helps in providing you shiny and lustrous hair. The acidic property of apple cider vinegar can increase the porosity of your hair. Porosity is the ability of hair strands to absorb as well as maintain moisture. This way it keeps your hair well moisturized. Apple cider vinegar has the ability to smooth the cuticle of the hair and this helps in preventing split ends and breakage of hair. 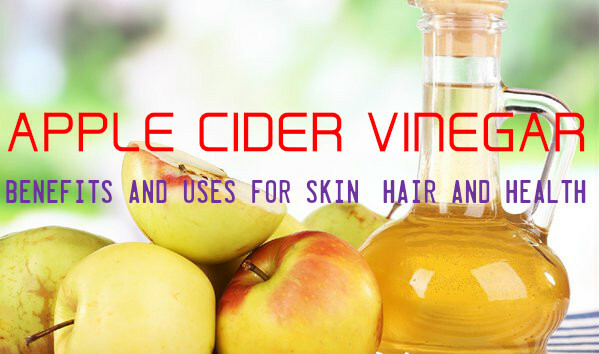 Apple cider vinegar can untangle your hair and allow you to comb your hair without any difficulty. If you suffer from indigestion, all you have to do is to add apple cider vinegar and 1 teaspoon of honey to warm water and sip it before every meal. You may also add one tablespoon of apple cider vinegar to a jug of water and drink it every now and then. It can also help in reducing gastritis, bloating and burning sensation in the chest. Pectin ensures proper bowel movements and prevents constipation. Apple cider vinegar can keep the sugar levels of the body within control. This is because of the anti-glycemic properties of apple cider vinegar. Take a glass of water and add 3 teaspoons of apple cider vinegar to it. Having this three times a day is all you need to keep the sugar levels normal. Pectin present in apple cider vinegar is good for treating diarrhea. It is water soluble and forms bulk fibrous matter. It is also good for calming intestinal spasm by forming a coating on the linings of the colon. Mix apple cider vinegar to water or juice and drink it. This will give you relief from diarrhea. For treating common cold, cough and sore throat, you can make a concoction by adding 1 teaspoon of apple cider vinegar and honey to one glass of warm water. You may also add some mashed ginger and garlic to it. This will give you immediate relief from these symptoms. Apple cider vinegar contains electrolytes, which give you relief from fatigue and lethargy. All you have to do is to mix 1 teaspoon of apple cider vinegar to one glass of vegetable juice and drink it. Apple cider vinegar is rich in many essential nutrients needed for the body, like potassium, phosphorous, sodium, calcium, bioflavonoid, magnesium, pectin, copper and Vitamins A, B1, B2, B6, C and E.
If you suffer from blocked nose due to sinusitis, apple cider vinegar can help you get relief from it. Drinking diluted apple cider vinegar can drain the sinus and clear your nose. Drinking apple cider vinegar to which water is added can help you get rid of hiccups. Potassium in apple cider vinegar can prevent the buildup of calcium in the joints. Accumulation of calcium can cause stiffness of the joints. Including apple cider vinegar in your regular diet will get you relief from arthritis pain. Are you suffering from leg cramps? Just take some apple cider vinegar and dilute it water. Add some honey to it and have it whenever cramps occur.